Thomas K. Martin was born in a small mining town in the Cumberland Gap region of Kentucky near the West Virginia and Tennessee borders. His father served in the U.S. Air Force, and the family moved frequently when Martin was a child. Martin came to Texas with his parents in 1974 and has lived in and around Dallas / Ft. Worth ever since. Martin published his first novel, A Two-Edged Sword (the first book of The Delgroth Trilogy), through Ace/Berkley in December 1993. He completed a second series, The Magelord Trilogy, in 1999. 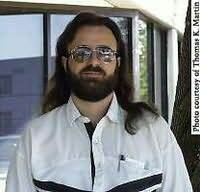 Apart from writing, Martin also works as a computer programmer, creates his own chain mail and serves as a member of The Artemis Society of Dallas. He lives near Dallas with his wife, Mary, and four of their five children.